The beginning of my two day review update madness. Do please bear (hehe, pun) with me while I catch you up on my amazing reading vacation. I am entirely grateful to all the readers of my blog, and I do sincerely hope I have given you worthy recommendations to your new favorite book. A fantasy novel for the middle-aged reader, the whole story was still quite enjoyable for the adult reader. This is going to be a great book to read with your kids and hold some actual intellectual substance on top of its entertainment value. There are dragons, a jungle princess, a paranoid bear, and celestial constellation references galore. The pace moves along with plenty of action, humor, and growth. Every character and city from Arcas has a relation to the very constellations in our own heavens. Make sure you really utilize the star chart the authors have provided at the back of the book. 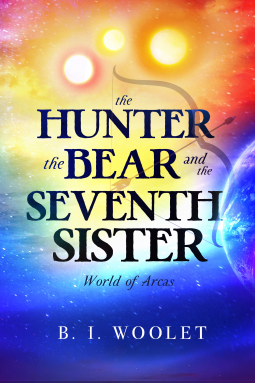 This novel is bursting with a nebula of new ideas and visions for the fantasy genre for young readers. All of the characters were very likable, even the villains. There was one moment of grim (but not graphic) violence that just about choked my own heart. It has been a very long time since I have been that gripped by the written word and I cried, big time. Kudos to the Woolets. I have to admit that as an adult reader I did see the plot twist coming pretty early on, but I don't think it detracted enough from my enjoyment of the story. The whole story just made me happy to be a reader. I was very invested in the tale and look forward to the next installment. (If you are incredibly dorky like myself) I can just imagine "lesson plans" to go along with the read-along for kids. There is no way a creative person could make this book fail to illuminate the child within. I am really hoping that the Woolet couple can continue their series in this vein. I highly recommend this starting novel. The price is right. The story is fabulous. There is really just NO reason not to pre-order it today here (plus get free access to chapters 1 and 2).